Looking for photos from the Scavenger Hunt? They are up and loaded! Just click here to the PBCHW Events Shutterfly Share Site. Please, feel free to upload your pics into an album as well. Video: Conception to Inception – the creation of Back Country Horsemen (YouTube, no subscription required) The video covers the very beginning of Back Country Horsemen, an educational / service group of trail riding folks from across America, now with over 15,000 members in upwards of 170 clubs from the Atlantic Ocean to Pacific tidewater. Welcome to the Ponderosa Back Country Horsemen (PBCH) website. Through this site we hope to inform you about the many facets of PBCH. 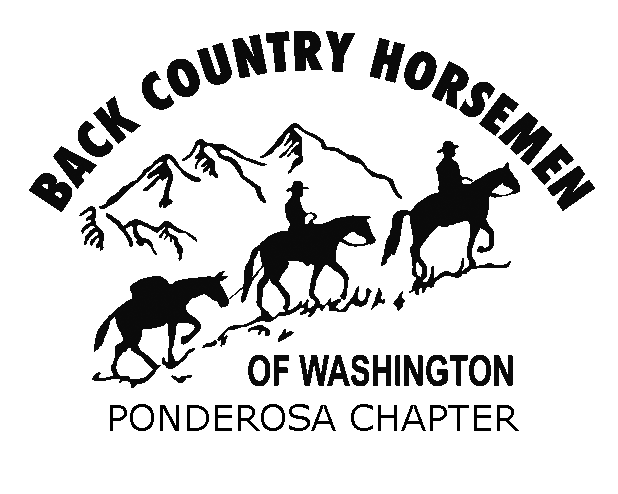 PBCH is part of much larger organizations, the Back Country Horsemen of Washington and the Back Country Horsemen of America. Through these cooperative efforts we are able to provide support for keeping trails open to equestrians. Briefly our mission is to preserve the rights of responsible horsemen to use horses on public land. We do this through work parties, education and advocacy for equestrians. In addition there are events to enjoy such as rides, campouts, education and fundraisers. We have a monthly newsletter where we like to share timely information and activities. It is posted to our our Facebook page and emailed to our members. We are a non-profit 501C3 organization which means that memberships and donations to PBCH are tax deductible. Thank you for viewing this website and learning about Ponderosa Back Country Horsemen. We encourage you to join PBCH and participate in accomplishing our mission. Please contact us with questions and comments. As a 501C3 organization, The Ponderosa Chapter of Backcountry Horsemen of Washington (PBCH) has enacted the following policy: PBCH does not endorse or oppose any political candidates, donate or contribute to any political candidate’s campaign, participate or engage in political fundraising events, distribute statements for or against particular political candidates, nor engage in any other activity that may constitute favoring or opposing a political candidate.